Your vacation isn’t complete until you’ve experienced a Lake Tahoe guided outdoor adventure! Grab an oar and navigate white water rapids on a thrilling Truckee River rafting tour. Lace up those boots and hit the hiking trails with an experienced guide. Feel your heart pump in your chest on one of the thrilling Lake Tahoe helicopter tours. For the more faint-at-heart, a bus tour around the lake will be adventure enough. With so many ways to tour Lake Tahoe, it’s hard to know where to start. Here are a few of our favorites! Prepare to get splashed when you book a whitewater rafting trip with Tributary Whitewater Tours. Navigating rivers such as the Truckee, American, Yuba, and Carson is easy with a highly-trained guide who will give you a fun-filled and unforgettable adventure. The Lake Tahoe Adventure Company will set you up with an exhilarating kayaking trip, a mountain biking escapade, hiking expedition, guided rock climbing trip, or a combination of two or three of these for a multi-sport experience. Get an overhead view of Lake Tahoe attractions from the jump-seat of a whirlybird provided by Sierra Air Helicopter Tours. 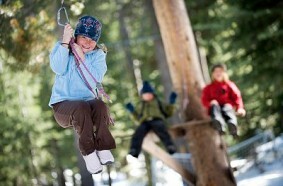 Squaw Valley High Camp is an adventure the whole family will love, starting with panoramic views of Lake Tahoe. You can also test your rock climbing abilities, show off your ice skating skills, slip and slide down the snow tubing hill, take a dunk in the swimming lagoon or relax in the spa. Lake Tahoe adventures are abundant and will add a thrill to your vacation that will create memories to last a lifetime. Book your Lake Tahoe adventure today!